After 20 years of heartache, disappointment, a little joy and plenty of insults from opposition supporters, finally we again can say we are the premiers!!! It just feels so good. Nothing can spoil my mood this week. The party will continue for quite a while I think. What a great year it has been for everyone associated with the mighty pies. We beat the bulldogs twice, thrashed Essendon on Anzac day and then again in the return match, flogged Carlton twice, then beat St Kilda and Geelong in the second half of the season to finish minor premiers for the first time since 1977. What an omen that turned out to be with the drawn grand final 4 weeks later. Luckily the replay result went the other way this time. I was very lucky to be able to attend both grand finals. What an experience. I will remember them for the rest of my life. Such great moments. Such great heroes. Like Alan Didak, with his pectoral muscle torn from the bone; kicking a miraculous goal in the drawn match from over the boundary, then the brilliant smother and goal on his non preferred right foot in the replay. Heath Shaw’s unbelievable smother to deny St Kilda their first goal of the match. Dale Thomas was brilliant in both matches and kicked a great goal from 50. Pendle’s Norm Smith medal, Jolly dominating the ruck and kicking some great goals. Maxwell now a premiership captain; lead by example, saved the game for us in the draw with a desperate dive to deny a St Kilda goal and then later a brilliant mark deep in defense when the saints were pushing of the winning score. What a special player Steele Sidebottom will be, close to best on ground in the grand final in only his second year. Ben reid playing on with a fracture. There is just so much more to talk about. I will do a full wrap up in another post after I have watched the dvds a few hundred more times. The after match celebrations were sensational and for me very emotional. I had tears in my eyes quite a few times during the last quarter and then after the game. I hugged complete strangers and also family members. We went over to the Westpac centre and enjoyed a few “quiet” beers and reflected on what the boys had achieved. Then it was off to Aami park to see the team and the cup. Lionel Richie was great (and I usually like death metal haha!) I think our celebration song will now always be “dancin’ on the ceiling”. We got to see the “shimmy” again and some great dance moves from Harry O and Daisy. I went home about 10pm so I could be ready for the family day the next day and get to the newsagent nice and early for 2 copies of every paper. I even bought the Herald Sun which I had previously vowed never to buy again after the “Didak killed my son” front page a few years ago. –	Grand final records from both games still in the plastic, as well as records from every final. I’m sure there will be plenty more to come. I’ll try to catch up with as many of my pies supporting mates as possible in the next few weeks. It will be great to have a few beers and cherish this wonderful year of football. GO PIES!!!!! AFL PREMIERS 2010!!!!!!!!!!! 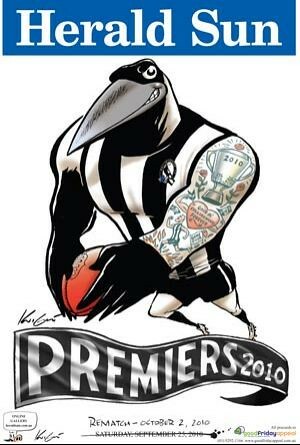 This entry was posted in sport and tagged afl, aflgf, collingwood, gopies by admin. Bookmark the permalink.